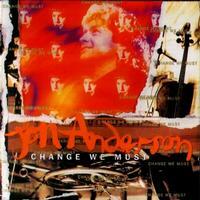 This is a newly remastered version of the Jon Anderson Change We Must album. It’s got a couple bonus tracks in the form of an interview about the disc and a single edit of the title track. This is definitely progressive music, and we put stuff by Jon Anderson under prog anyway based on all his work in progressive rock. There’s not a lot of “rock music” here, though. This lands a lot closer to classical music. That doesn’t mean it’s not magic, though. In fact, this release is very special and I like it a lot. This was a song Anderson did with Vangelis. It was later covered by Donna Summer, believe it or not. This arrangement is symphonic and it lends a real organic element to the piece. Anderson’s vocals drive it. There is a choir built in at times. This is definitely a different take on the piece, but I like it a lot. The music to this one is even more unusual. It’s got a freeform vibe to it, but is all classical. At times it feels like soundtrack music to a classic thriller (that’s meant as a general concept, not as a specific movie). The vocals, though, are even better than those on the opener. Multiple layers create melody, drama and magic. This is an unusual song that has a bit of a learning curve, but it’s well worth it. This is a song that was on the Yes album 90125. In a lot of ways this sounds like that rendition. Yet, the classical instrumentation brings a real organic vibe to the piece that works well for it. I don’t know which version I like better, this one or the original one. Both of them are great. In fact, both are highlights of the albums on which they appear. This piece is symphonic and purely sans vocals. It’s quite dramatic and pretty and a nice touch. There is a gentle, but intricate and playful classical vibe to this piece. It’s a pretty one that’s accessible. Seeming to come straight out of the previous number, this has a more serious and quite pretty classical arrangement. It has some operatic vocals provided by Sandrine Piau. I’m not a big fan of opera, so that part doesn’t work all that well for me. When they are actually paired with Anderson’s vocals, though, it works better. That tempers them. Of course, a lot of people love opera, so any misgivings I have wouldn’t apply to those folks. It’s a good track, though. The fact that I like it as much as I do despite those vocals tells you just how good it really is. This fast paced, but still classical instrumental features a prominent piano part. I like this one quite a bit. I love Jon Anderson’s vocals on this tune. He really creates some great melodies. The classical instrumentation, particularly the violin, does a great job of accompanying that. Another instrumental, this is energized and fun. It never feels like soundtrack music (as some classical music can) but rather seems like a symphony concert piece. As much as I like Anderson’s original version of this (and I really love that one) I think I like this version better. The symphonic elements seem to give Anderson’s voice more room to really shine. He weaves the lyrical tale via some great melodic lines. The symphonic instrumentation (and a choir) rise up at the right points to lend an urgency and an emphasis to the song. This is definitely another highlight of the set. I’m absolutely in love with the bouncy island kind of vibe to this song. Anderson’s vocals work perfectly to convey that sort of element and this is another great song on a disc that’s full of them. This is one of the most dynamic and intriguing pieces here. It starts with a very gentle, but intricate and involved classical arrangement. The piece grows gradually and gets some of the disc’s only real rock music built into it, too. This is an epic kind of piece in the way it starts at one place and continues getting more intense and more involved as it grows. It’s also another highlight. I love everything about it. It’s a nearly perfect piece of music. The first of two bonus tracks for this new edition, this is an interview with Jon Anderson – exactly as the title suggests. The interview is more or less five minutes in length and focused on this release. Bits of music from the album serve as interludes and backdrops during the interview. Here we get the single edit of the title track. It works reasonably well in this format, but does miss a lot of the pure magic and majesty of the full rendition.